Description: Best kept secret in ks! Bask in the sun and fun of lake of the forest. Something for everyone: golf, tennis, volleyball, lake access & clubhouse all in gated community. Amazing lake views from 1st tier property. Completely remodeled and ready for new owners. Large bonus rm could be 4th bedrm. 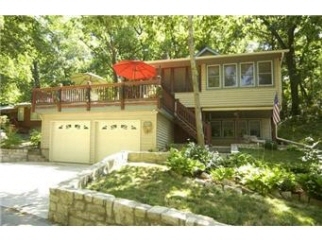 Huge deck & covered porch offer lake views. A must see! From K-32 & I435. W on K-32 to Lake Forest entrance. House on East side of lake.